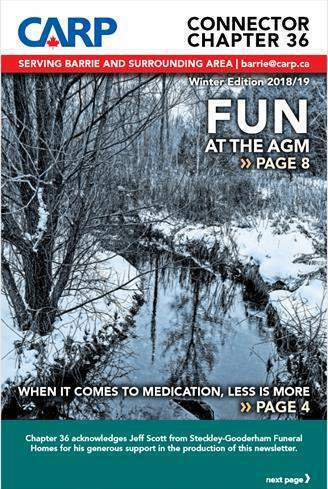 Starting in September 2010, CARP Barrie Chapter #36 has issued a quarterly Newsletter to registered CARP members in Barrie and surrounding areas, which now number about 3,000. It is mailed (via Canada Post) to those that have not shown an e-mail address and e-mailed to those of you who access to internet. A lot of time goes into producing a product of this quality and it is always great to have help. If you have some experience in this area or would like to work with Phyllis Mahon, Newsletter Editor, please let us know. We are always looking for new ideas and of course people to help with this aspect of our chapter. If you have any article ideas and/or would like to sponsor part of the Newsletter, please contact us by emailing us.